During extraordinary days, I like wearing waterproof makeup. That's why Shu Uemura Cleansing Oil is my favorite when it comes to makeup removers as it wipes off waterproof makeup effortlessly. When the Celeteque Anti-Aging Trio was introduced to bloggers a few months ago, the Anti-Wrinkle Untra Light Cleansing Oil was the one I was most excited to try as it seems to be a cheaper dupe of my much loved product. 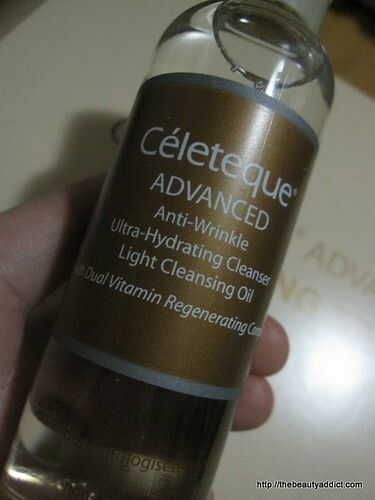 Celeteque Advanced Anti-Wrinkle Ultra-Hydrating Cleanser Light Cleansing Oil -- Effectively removes makeup, deep-seated dirt and impurities while maintaining the skin's natural level of moisture, instantly leaving the skin velvety soft and dewy without the greasy after-feel. It is clinically proven to deliver marked improvement in skin smoothness and reduction of lines with continued use. How to use: Gently apply on your dry face in a circular motion. Wash it with lukewarm water to ensure that oil is thoroughly rinsed off. You can also use it everyday for thorough cleansing. Just use a few drops on a cotton ball and apply to face and neck to remove make-up and deep-seated dirt. 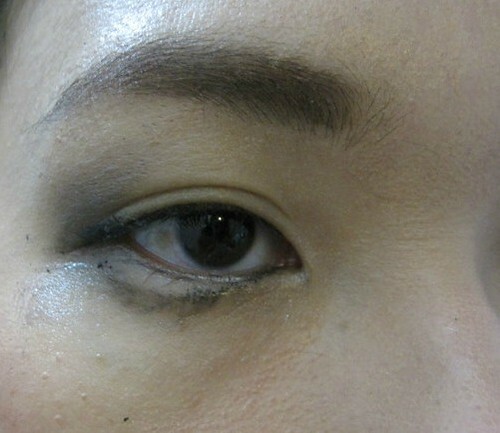 My stressed eyes with smudged makeup. If you follow me on twitter @kimbabot, I went to an event at The Goose Station, Fort Bonifacio a while ago. I knew it was a secluded place so I prayed not to get lost as it was my first time to drive going to that area. Hurray I arrived there with no hurdle!....but I got lost going back haha. So can you just imagine how stressed I was? I just kept on driving until I reached EDSA...I thought I was going South already haha. God still loves me as I was able to go home with no MMDA trouble. Enough blabbing...here's what I do to remove my makeup: 1) I put a few drops on a cotton ball 2) Gently press it on my lids for at least 10 seconds. Tadah! 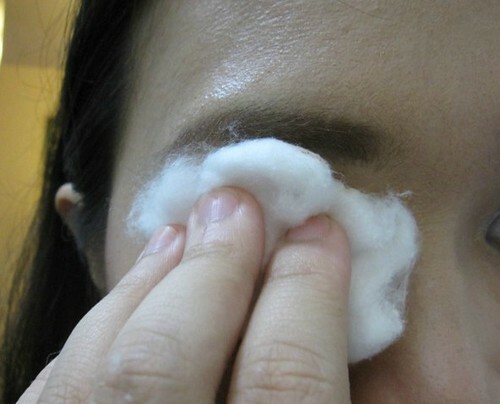 Here's how it removed my makeup without wiping the cotton. As skin care: I can't find the link but I've read somewhere that if you can skip your moisturizer at night by leaving this on your face after wiping off the dirt as it has anti-wrinkle and hydrating properties. However, I can't sleep with an oily feeling on my face so I wash this off with a facial wash. If I sometimes find the oil a bit hard to remove, I wash my face twice :) After that, my skin is clean and soft already. I also like that I never had skin reactions using it and it has no weird scent. When it comes to wrinkles, I can't attest to that yet sorry! As a makeup remover: This is a very effective makeup remover. However, for waterproof makeup, I find that I use a lot of product and step repetitions to completely remove it. But who cares, it's only P199 for 50 ml and P369 for 100ml! It does what expensive products do with just a tiny con. Overall, this is a product worth trying. It works and it's really affordable. Thanks to Unilab for offering another great product to us!